A burst of cranberry and sweet apple provides a sweet yet tangy flavour, and antioxidant vitamin C contributes to the protection of cells from oxidative stress. 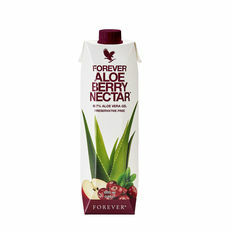 These amazing ingredients, plus 90.7% pure inner leaf aloe vera gel, makes Forever Aloe Berry Nectar a powerful choice. Warning If you are pregnant, breastfeeding, planning pregnancy, taking any medications or are under medical supervision, please consult a doctor or healthcare professional before use.